I've got quite an odd relationship with Dragon's Dogma. When it was originally released on the PlayStation 3 and Xbox 360 way, way back in 2012, I was fresh off the back of Dark Souls and was hungry for a similar swords-and-sorcery experience. With its grim fantasy setting and frenetic third-person combat, Capcom's brand-new IP seemed like the perfect successor to sate my thirst – but it proved to be a very different game in terms of mechanics and challenge, and while I didn't fall as head-over-heels in love with it as I did with FromSoftware's often punishing epic, it certainly left a mark. So much so that when Capcom released Dragon's Dogma: Dark Arisen (the 2013 expansion to the original game) on the PlayStation 4 in 2017, I decided it was worth making a second trip to the wilds of Gransys to fight goblins, zombies and griffins. To give you some background, I rarely replay a game as convoluted as this; Dragon's Dogma requires tens (if not hundreds) of hours of commitment from the player, and I simply don't have many hours to spare these days. Yet here I am, already tens of hours into Dragon's Dogma: Dark Arisen on Switch, and I'm still not entirely sure how the game has sunk its hooks so deeply in me. I'll save my deeper impressions for the full review, but Dragon's Dogma is exactly how you'd expect a video game from 2012 to look and feel. It has moments of true visual splendour which are counterbalanced by basic character models and obvious pop-in, while the repetitive nature of many of its quests can become bothersome, especially when you're a good few hours in. Despite its obvious shortcomings as a game, Dragon's Dogma somehow manages to entertain in a way that few other action RPGs can – as is evidenced by the fact that I'm playing it for the third time, and, as before, I literally can't think of anything else when I'm not playing it. Family mealtimes are now ruined by me absent-mindedly thinking about which of the nine vocations to switch to next so I can expand my character's move-set, and in the evenings I gently encourage my wife to 'have an early night' so I can get back to my important work around the bustling city of Gran Soren. Of course, this addiction is made all the more worse with the Switch version because now I can play it anywhere. With the previous versions, the massive land of Gransys was tethered to my television, but now I can explore its lush forests, rocky mountains, sandy beaches and dank dungeons wherever and whenever I like; of course, there are other Switch ports which have liberated home console games in this manner (it still amazes me that Skyrim can be played on a portable system) but Dragon's Dogma has special significance to me; this is a vast, sprawling world that I've already spent well over 100 hours exploring on other consoles, yet the fact that I can now take it with me anywhere I like means I'm finding stuff I'd missed the first (and second) times around. 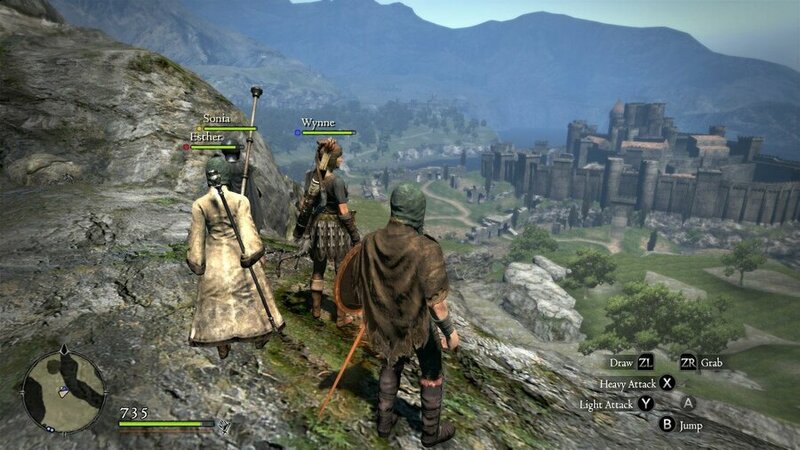 Given its age, it should come as no great shock to learn that Dragon's Dogma runs like a dream on Switch. In handheld mode the resolution drop doesn't really impact things massively, and while there are moments of slowdown, they're no worse than they were on the PlayStation 4 'update'. There's been a slight change to the way in which Pawns – your AI helpers – work, no doubt necessitated by the fact that you don't need a Nintendo Switch Online subscription to exchange them between players. You can use your Nintendo ID Account to swap them instead, but it's no longer possible to send them away with a gift and comment when you part company with them; a minor change, but one that feels significant to me, at least. I used to like the 'human connection' of sending a player's helpful Pawn back to them with a thank-you note in tow. But as I said, I'd best save some detail for the full review, which I imagine I'll take great pleasure in writing. 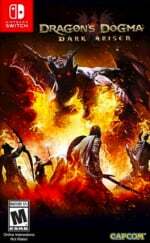 Dragon's Dogma isn't the perfect action RPG – far from it. It's flawed in many ways and, when you break down its mechanics, is arguably out-done by many other examples of the genre. However, it has that special something – hence this being my third enthusiastic visit to Gransys – and being able to play it while sitting on the toilet is an early contender in my personal list of 2019 highlights (sorry for sharing). This is my triple dip for DD. And I can’t wait! Yep, I`m getting this. Luckily It`ll be my first time. I'm waiting for this game to release, this month to pick for sure! I have it on PC with the ENB graphics mod, which makes the lighting look so good I could never go back to playing the murkier vanilla / console versions. Won't be getting this on Switch at launch (self-imposed purchasing limitations combined with a focus on previously existing backlog items), but it's good to know its a well-done port. Playing RPGs on the go is where the Switch's portability really starts to shine, imo. Same boat as @Ralizah, but I’m definitely looking forward to playing this eventually. Flaws aside, I’ve heard little but praise for its combat system, and I’m intrigued. This is one of the best buys on the Switch. And for such a low price, who can resist! My experience with the game is similar. It didn't do much for me on PS3, but I kept hearing good things about it so I picked up the PS4 update, and the next thing I knew I was sinking time into the game in all hours of the night. It's insanely customizable, with lots to do, lots to fight and many ways to do it, and it manages to be pretty challenging to boot. And now that it's going to be portable, well...this will be one of the few games I'm definitely going to double (or triple) dip on. Can't wait. @ArcanaXVI I have such a large backlog across so many systems. It seems like a shame to make Switch yet another system with a "pile of shame." It's also wasteful, considering most non-first party games will eventually drop in price. I had this on PS3, but then sold my PS3 and never got to play it. I always wanted to play it for the first time, it will be perfect for on the go on Switch. @Ralizah I feel your pain. Been working through my 3DS backlog lately (so many RPGs ...) and trying to forget that my Steam backlog exists. You’re right—remembering that things will go on sale eventually helps to prevent the buildup. A little. Just picked this up for 7 quid (for my ps4). Bought it years ago for my 360 buy never came around playing it so I'd better sink some hours into it this time. @yuwarite ditto, I bought on GOG.com cheap, so I own it outright and will never have to buy it again. With mods, it looks and runs brilliantly...no going back to consoles with this. @Lone_Beagle At first I thought the same the same thing. Having played through it recently on PC with a bunch of mods, but I'm actually starting to look forward to playing it handheld for some reason. Have it on the PC, but this is one case where I might actually get the game again on the Switch because I'd like to have it anywhere, and I don't have to make heavy compromises like if I were to play Doom on the Switch. Not that Doom as it is on the Switch isn't impressive, but the keyboard and mouse controls and framerate are really important to me in a game like that. @Mountain_Man Nope, you can pre-order the physical version right now on Amazon for $29.99. I've already played the original release to completion but I never did get the DLC and Dark Arisen expansion, so I'm giving it a double-dip. When you consider that the original game was already awesome and this version includes all of the extra content, $29.99 is an absolute steal! @ArcanaXVI I find that my home consoles (and Steam, yes, because accumulating an absurdly large library on Steam is practically a law of nature for anyone inclined to take advantage of steep sales and humble bundles) tend to have the largest backlogs. I play on my handhelds more often thanks to increased accessibility, which reduces the psychological friction involved (I can pull out my handheld whenever, but home console/PC games feel like I need to plan around them). Anyway, I've resolved to finish double the number of games in a year that I buy, which makes me think very carefully before I add a new game to my library. @daebiya Hey, at least in the case of buying drink for strangers, you know people enjoyed themselves right away. Also, I imagine the prices of drinks don't go down significantly over time. Imagine buying an expensive bottle of alcohol of some sort (I'm practically a teetotaler, so no examples come to mind). You intend to drink it eventually, but you already have a number of other bottles sitting in your fridge, waiting to be drunk. Moreover, you discover that, if you had waited a while, you could have purchased that bottle half off. Ordered this on PS4 two-three days ago, after reading several reviews, watching lots of videos, and debating with myself whether to buy it or not. Remember guys to buy this one if you want to play some DMC5 lol. Third time I'm jumping into it too and I can't even regret it a little bit. I spent dozens of hours on that game and now it'll be my most-played game alongside Arena of Valor and Splatoon 2. @daebiya that was funny! I need to start a spreadsheet too. Got this pre-ordered and had an amazon discount to make it like 20 bucks thought it could be fun. I've been curious about this one and will likely pick it up. We all know NL will give it an 8/10. I will probably wait too though since I'm playing Horizon Zero Dawn right now, then FF12, then Mario Maker 2. Traded my PS4 copy toward it. I can’t wait. Spent most of my time on the PS3 version. Like I need another game....they just had to budget price this didn't they?! Best Buy discount still in affect, yeah, ill spend $24! Will be my first time playing through this one. Pretty stoked after hearing more about it. I love grinding in this game because of its art and crunchy animation. Now I can play it on the go and then play it on the TV when I reach hotel or at my relative's house. I have it pre ordered on Gamestop. The Switch has become my capcom machine with Street Fighter, Monster Hunter, and now Dragons Dogma. I am pumped. Gotta go to bb tomorrow anyway and I have 5 bucks off. Maybe I shall beat Dark Arisen finally. Got to the end boss and got murdered. Day One for me I ordered the Japan version since it is a Collector's Edition. Just wish I could transfer my save from the Steam version. Remember having fun on this... Never finished it. CrossSave with PC like CIV6 would be great. Going to pick this one up, never played it before and know nothing about it, despite using Steam for ages.